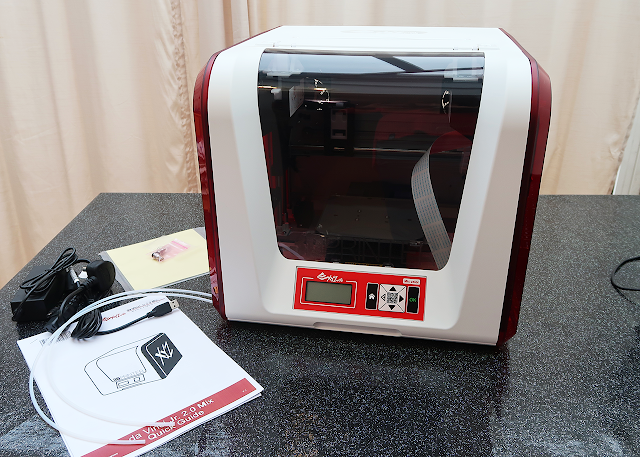 The Da Vinci Jr 2.0 Mix is a new 3D Printer from XYZ Printing. 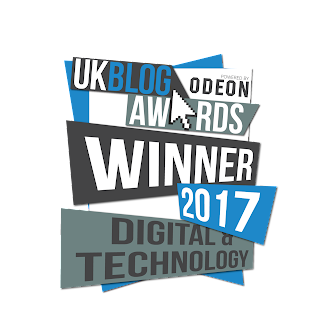 The big feature here is that it supports colour mixing of two colours to create multi-colour prints in an inexpensive printer. One of the common questions we get when we take a 3D printer to events is 'can you print in multiple colours'. It's definitely a feature that people are interested in and while this isn't full multicolour it's a step in that direction. Disclosure: We were sent a Da Vinci Jr 2.0 Mix 3D printer to review. As always our opinions are our own. We're very familiar with the Da Vinci series of printers. 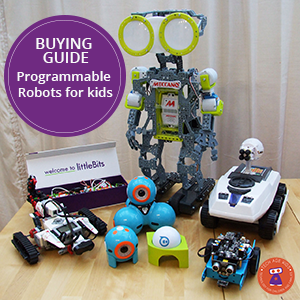 We previously reviewed a Da Vinci Mini Maker and then purchased a Da Vinci Mini which we have used in lots of projects. They are not the best 3D printers out there but they do offer excellent value for money and ease of use for beginners. 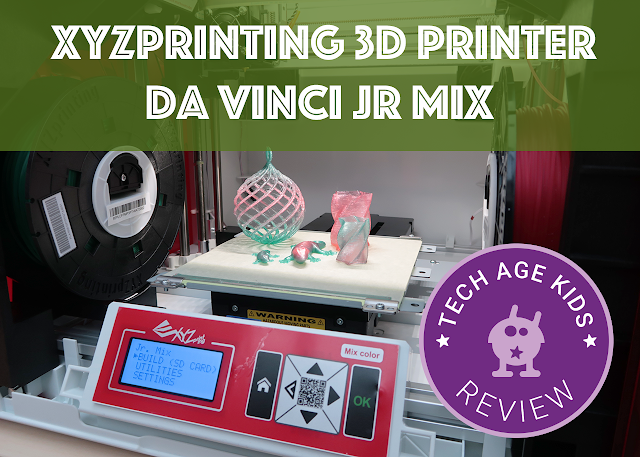 The Da Vinci Jr 2.0 Mix is one of a range of 3D printers for beginners from XYZ Printing. 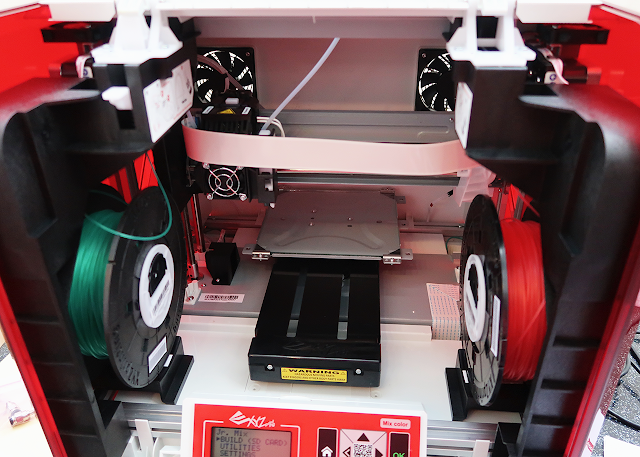 One of the key features of this printer is the enclosed unit which makes it easier to control the environment for 3D printing (temperature, no drafts) which in our experience is very important. 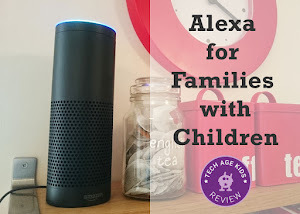 It's also a good safety feature especially if you have younger children around. The other major feature is the ability to print in 2 colours, either printing different parts of a model in different colours or blending vertically from one colour to the other. A side effect of this feature which we think might actually be even more important is that you can keep two different filament colours loaded at all times. Changing filament colour isn't hard but it does slow you down a bit. We've found that we're far more likely to print things with the children if we can use a colour that's already on the printer and keeping two filaments loaded makes this much more likely. The printer comes in a big box and includes filament to get started with. You have to remove some packaging parts from the printer itself and do a small amount of setup. After some searching, we found the extruder head in the box with the filament reels. The setup was fairly straightforward but the instructions could have been clearer. You will need to load the filaments and calibrate the printer. This is all done from the display and controls on the printer itself and doesn't take too long. You'll also need the XYZWare software on a PC or Mac to drive the printer and may be prompted to update the firmware on the printer. If the printer is a gift then we'd recommend setting up the printer and installing the software in advance so it's ready to go on the day. This printer takes up quite a bit of space but the filaments are stored inside so it's quite self-contained. You can import STL files created by lots of different 3D modelling packages (we like BlocksCAD, Microsoft 3D Builder and TinkerCAD) into XYZWare. We recommend fixing up models in Microsoft 3D Builder first as that does a great job. XYZWare allows you to set up colour blends on a single model in vertical layers. You can either have layers of solid colour or blend from one colour to another. it's worth taking a bit of time playing with this feature and previewing the results so that you understand how it works. It took us a bit of playing around to work it out. 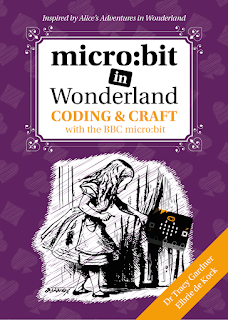 You can send models to the printer via Wifi or a USB cable. If you use a cable then you don't need to keep the computer connected once the model has been transmitted. Wifi is handy if you have a computer in a different location but you are going to have to go to the 3D printer and turn it on and check that everything is ready. We've found the da Vinci Jr 2.0 Mix to be really reliable. The enclosed unit really seems to help with consistency compared to the da Vinci Mini that we normally use which can be susceptible to changes in room temperature and drafts. The items we have printed have been great quality. The blending feature is neat and we feel it's something that's really handy to have for certain projects. It works and we like it, but honestly, we could manage without it. But, we love the fact that we can keep two different filaments loaded at the same time. That's actually an even better feature for us and one that we would pay extra for. The colour effects are a bonus. It's not a particularly fast printer but it's not bad for the price point. The ease of use is excellent. Yes, this printer uses propretary filament. 3D printing experts tend to think this is awful. But it's a trade-off. It means that the results are more consistent because the printer is tuned for that filament. You can buy cheaper filament but actually we've found that if you look out for good deals then the XYZ da Vinci Jr filament isn't that expensive compared to good quality filament and you need to consider that you're likely to have fewer failed prints. Our main complaint about the proprietary filament is that the range of colours isn't big enough. There are some fab colours but not enough of them. In particular, we'd like to see more solid colours. Solid colours aren't recommended for blending but we prefer them for most single colour objects. Hopefully, the range of colours will increase in future and this won't be an issue. Here are some pictures of the objects we have printed so far. We found that the sample objects that came with the software are a bit big for first prints so we scaled them down. We've tried out the blending feature first, we'll come back to printing in two discrete colours later. 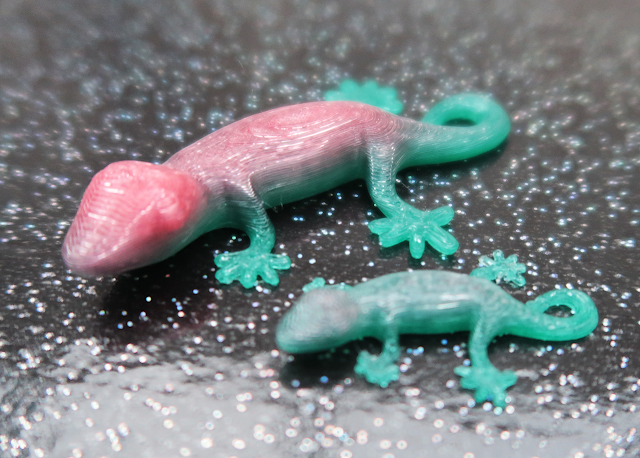 The gecko is a model from Thingiverse which we thought would look cool in red and green. 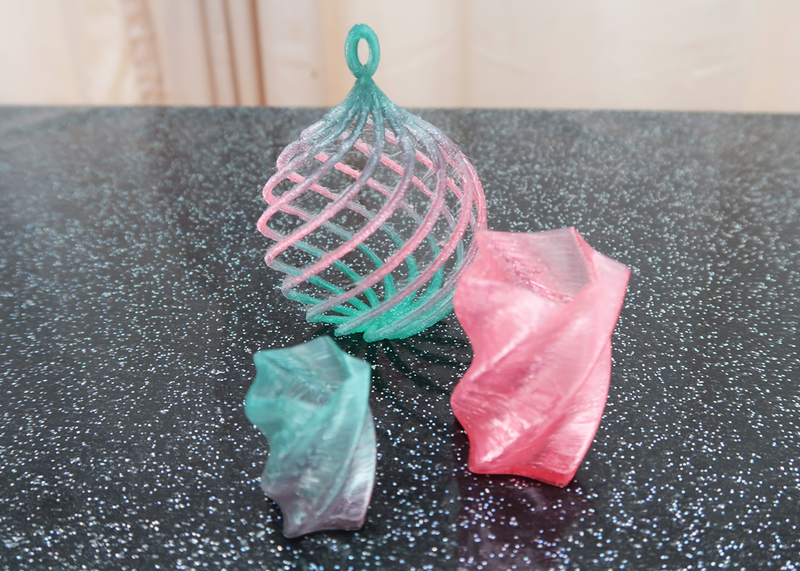 The Christmas bauble also came from Thingiverse but was a little fragile in the transparent filament, it was a good test and we were impressed that the printer managed to cope with it so well. We like this printer. If you can afford to pay a bit extra for a beginner 3D printer then this one is practical and a lot of fun. The enclosure makes printing reliable and also keeps the dust off. Being able to keep two filament colours loaded at the same time is fantastic and the two-colour modes are a lot of fun. If you need a cheaper beginner printer then take a look at the XYZ da Vinci mini or mini Maker which don't have an enclosure and only print in one colour. This might just be the next 3D printer we get for our business. The enclosure and two colour feature are very practical. And we can think of lots of fun things to do with the two-colour modes that will allow us to get more creative with 3D printing.